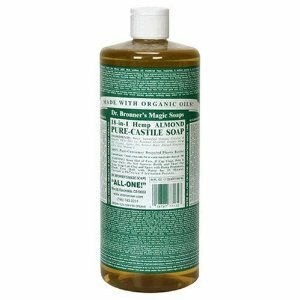 Pure Castile Soap by Dr Bronner contains all natural organic ingredients and recycles and reuses all post consumer bottles. Which I'm sure those of you that are eco friendly will find a huge plus. This liquid soap can be used for multiple tasks like cleaning floors, bathrooms, fruits, pets, body and is even good for shaving. Castile is a very mild natural soap that has water softening and cleansing properties. This makes it more desirable over harsh synthetic soaps. It also contains almond oil for its calming, soothing scent. It doesn't contain any foaming agents and is 100% vegan. Dr Bronner has created a very desirable product it seems as most people say it is a great multi purpose cleaner that smells amazing, cleans well and is all natural and organic. The only problem that some patrons had with the soap was that it is lavishly priced at $27.90 for 2 32oz bottle. Personally I don't think that is a too bad price considering it can be used to clean almost everything. You are currently browsing the archives for the Dr. Bronner category.